Each relationship, each interaction with others, molds us in ways that are both ordinary and sublime. We weave those experiences, old and new, into our concepts of self, and we change. We alter the ways in which we interact with others based on these ever-evolving perceptions of the people we are and the people we are becoming. In her short story collection, Woman, Running Late, in a Dress, Dallas Woodburn, winner of the Cypress & Pine Short Fiction Award, the international Glass Woman Prize, and a four-time nominee for the Pushcart Prize, explores these complexities through the eyes of multiple characters. The stories are interwoven with each main character playing a role in another's tale. In a way, the collection reads like a novel. Each of her 13 short stories is a chapter in the story of the larger narrative. But this novel offers no conclusion, no satisfying ending. It is a moment in itself, a precipice of change. The collection focuses on a particular group of friends and key moments in the lives of each. Katie and Scotty are children dealing with divorce. Deepti struggles with the weight of her dead mother's influence on her current attempt at a relationship. Erick is molded by the ghost of a sister who lives in the shadows of his childhood. Emily cannot cope with her father's terminal illness. In a story that appears later in the collection, Kate hosts a party that includes Deepti, who has broken free of her mother’s influence and of her previous boyfriend. These are interlinked stories of love, grief, loss, and identity told with such honesty and empathy that it is difficult to put the book down. Woodburn's writing is reminiscent of John Updike, at once simple and sophisticated. Consider this passage from "Numb," the story of a woman who is grieving the loss of her daughter: "I didn't fall asleep. My eyes were closed, but my ears were not. I would have heard her crying. She didn't cry. She didn't, or I would have heard." The guilt is haunting. The conflict is terrifying. The pain is unbearable. With such simple language and uncomplicated sentences, Woodburn thrusts her fist inside the reader's chest and pulls out handfuls of compassion. She does this in each story with such maturity and insight that readers become personally invested in her characters. The characters are our neighbors, our friends, our parents, our coworkers. They are the clerk in the grocery store, the doctor in the emergency room, the teacher at the middle school. They are everyday people living everyday lives, like Emily, a young adult who struggles to come to terms with her grandfather's decline. After she hangs up, the image persists – Gunny in his big boat of a car, with his enormous old man sunglasses, his mouth slightly open as it gets when he really concentrates. Him navigating the crowded mess of the parking lot, then slowly making his way through the buzzing metropolis of a department store, searching for the earmuffs she mentioned once, earmuffs to keep her warm, the newspaper advertisement fluttering in his hand, as he searches and searches, but is unable to find them. Picturing it, her heart breaks and fills at the same time. Loss is a common theme in Woodburn's collection. Loss of a child, loss of friendship, loss of a marriage. Woodburn writes of loss with a raw kind of honesty that is exceptionally painful, as in "Near-Death Experience," the story of Sylvie, a woman whose husband nearly died from a stroke. The stroke changes her husband and she cannot change with him. He believes God spared him from death, but she had already lost all faith years before when death took her newborn daughter and left Sylvie behind: "I've pretended a lot of things the past sixteen years, but I can't pretend to feel that." Their marriage is over, but not for the reasons Sylvie shares. Readers know the truth, that the relationship between William and Sylvie thrived on its dysfunctional nature. William needed Sylvie to keep his drinking, his anger, and his infidelity in check. She reveled in his neediness and lusted for his recklessness. When William chooses Jesus as his savior over Sylvie, she is lost and so is their marriage. Marriage and motherhood are common themes in Woodburn's collection. Her exploration of motherhood is often painful, addressing infertility, loss of children, and fragile bonds with adult children. Sylvie wrestles with her miscarriage, but she also cannot shake the influence of her dead mother, much like Deepti in "Three Sundays at the Grove." The unnamed main character in "Numb" cannot see the connection between her physical symptoms and the emotions she left unattended after her daughter's death. Jared Sampson dies in a house fire in "Slowly, Slowly, Without Much Notice." In the next story, readers learn his mother, who insisted he stay home that night, crashed her car into a tree a few years later. 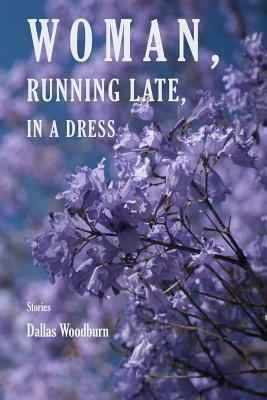 All the stories in Woman, Running Late, in a Dress take readers to a precipice, a point of emotional crisis where the main character has an opportunity to alter the course of his or her life. An expectation builds as we assume we will be rewarded with the final story. But we are not. Woodburn abandons her readers and the characters disappear. It is over just like that. It is, at once, disappointing and satisfying. We are not meant to understand what will happen next. We are meant to see how these lives are connected, how each person's actions and decisions affect the others, how they each alter the other's perception of self. Woodburn weaves the struggles of each main character into a portrait of humanity that is at once disturbing and beautiful, simple and complex. She leaves us at that precipice, looking back, rereading, searching for connections we missed, eager to understand more.